The Universal Monsters mixed with The Goonies sounds like a studio meeting gone wrong. To throw together two movies like that would usually end in unmitigated disaster but something about the way that The Monster Squad delivers this story actually works. It sets it’s stall out early, with a scrolling prologue explaining Van Helsing’s failure to deal with the monsters of the past and ending the explanation with “… they blew it.” Three simple words show the audience that this movie is not taking itself too seriously and it is all the better for it. What comes next is some usual 80s fare in a very 80s movie. 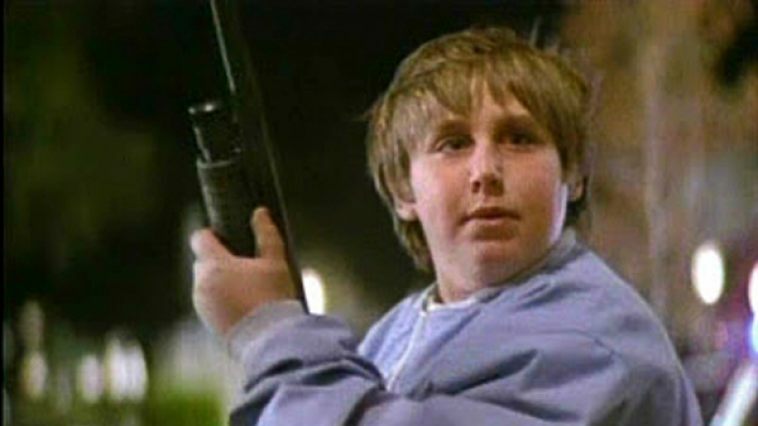 We are introduced to a rip-off Goonies, from the every-kid leader played by Andre Gower, the “cool kid,” played by Ryan Lambert, through to the “fat kid,” the “comedy sidekick” and a very young “holder-on” in the form of Pheobe, played by Ashley Bank. It should feel like a cheap rip-off but there is something charming about these kids and you get invested in their story early. Their evil counterparts are made-up of the more famous Universal Monsters. Tom Noonan’s Frankenstein’s Monster, Michael Reid MacKay as The Mummy, the Wolfman and The Creature from the Deep, all lead by a generic Dracula played by Duncan Regehr. It is a great idea, having a group of kids fend off the most famous monsters of the time and it is executed very well. At least, some of it is executed very well. The Mummy and Frankenstein’s Monster look great, the Wolfman, The Creature and the Dracula costume all look like cheap fancy-dress. It is a weird mix of styles, particularly when moments with The Mummy are genuinely creepy. It is a result of the period the movie was made, as is a lot of The Monster Squad. Goonies aside, there is also a soundtrack which could feature on many an 80s movie, a montage straight out of Rambo mixed with Home Alone and some of the strangest dialogue spoke by these kids that you will ever hear. Luckily, slang aside, the dialogue and writing is very funny. This is more than a small part down to Shane Black, of Iron Man 3 and The Nice Guys, being on co-writer duties. There are some very funny moments, some great dialogue between the characters and moments which pander well to the adults if they were watching with kids. Not that it would be entirely a good idea. Monster Squad feels like it should be a family movie, providing distraction on a Sunday afternoon, however some of the tone lunges wildly. There is a Holocaust reference, some very choice language and genuine scary moments which may make some parents think twice about showing their children a movie where kids take on monsters. That doesn’t stop it being entertaining for adults though and there is a lot to enjoy about The Monster Squad. It will keep you entertained and may even become a guilty pleasure. It doesn’t ask for too much attention but you’ll never be bored as you watch these kids fight the most famous monsters in movie history. 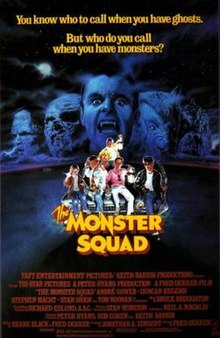 Overall, look past The Monster Squad’s clearly 80s setting and you have a clever idea, executed with a decent cast, very funny writing and some great monsters. Some of the effects and dialogue have aged the movie but there is still plenty to enjoy from this cult classic. I actually saw this movie for the first time last month, and it was so much fun! I only wish I had actually seen it as a kid, and I would have probably enjoyed it even more.. I know! I didn’t even know it existed until a couple of months ago.